Marco Silva insists he has no interest in the impact Manchester City's trip to Everton might have upon the Premier League title race. City will replace Everton's Merseyside rivals Liverpool at the summit on goal difference if they leave Goodison Park with victory on Wednesday. 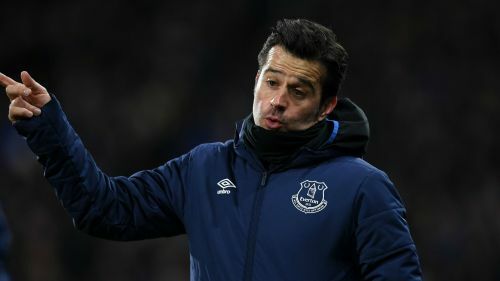 However, Silva's own predicament in trying to turn around a slump of three wins and seven defeats over the course of 12 matches in the Premier League since the start of December is at the forefront of his mind. Speaking at a pre-match news conference, he rejected suggestions that the loyalties of Everton fans might be compromised by their desire to see Liverpool fall short in their quest for glory. "What I want really and what my feeling is, it is not this title race," Silva said. "It is not for us to look to that fight. We know what is our fight. "For sure, what our fans want tomorrow is our team winning the game. At this moment, not just two teams are fighting – more than two teams are fighting for this title. There are many games to play. Nothing will be decided by this game against City." Silva's personal fight would appear to be keeping a job where Roberto Martinez, Ronald Koeman and Sam Allardyce have all been shown the exit door over recent seasons. Everton's recent slump moved owner Farhad Moshiri to restate his opinion that the former Olympiacos, Hull City and Watford boss is his man for the long-term and a coach who can develop young talent at the club. "This is something I have felt from the first day since I joined this club," Silva said of his boss' support. "When you are winning games the things people say are good. When you are not, it is normal this type of situation. "It is nothing new in our club. If you look at the last three seasons it is maybe every month this type of situation. I am here to talk about the present and nothing more. "You are always in contact [with Moshiri]. I know his feelings and our project." Silva will welcome back Idrissa Gueye after the influential midfielder sat out Everton's previous two games with a knock – a welcome boost for the challenge of taking on Pep Guardiola's side. "It will be really tough. In my opinion that team play the best football in the Premier League even if in some away games they didn’t achieve the results," he added. "They obligate the teams to suffer. They will play with 70 or 80 per cent of the ball. We have to be ready to suffer and be solid in these types of moments. "When we have our moments with the ball we have to be ambitious to try and make some damage on them."